TIMES NOW: After a $16-billion acquisition by US retail giant Walmart, Flipkart prepares to make an entry into the grocery segment with the etailer planning to launch services in five cities by July, The Economic Times reported citing two people familier with the development. 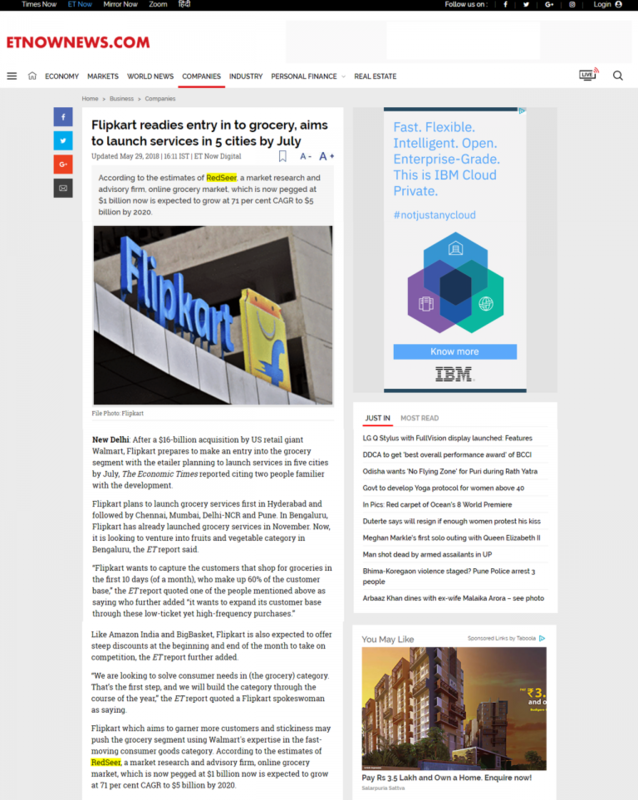 Flipkart plans to launch grocery services first in Hyderabad and followed by Chennai, Mumbai, Delhi-NCR and Pune. In Bengaluru, Flipkart has already launched grocery services in November. Now, it is looking to venture into fruits and vegetable category in Bengaluru, the ET report said. Like Amazon India and BigBasket, Flipkart is also expected to offer steep discounts at the beginning and end of the month to take on competition, the ET report further added. “We are looking to solve consumer needs in (the grocery) category. That’s the first step, and we will build the category through the course of the year,” the ET report quoted a Flipkart spokeswoman as saying. Flipkart which aims to garner more customers and stickiness may push the grocery segment using Walmart’s expertise in the fast-moving consumer goods category. According to the estimates of RedSeer, a market research and advisory firm, online grocery market, which is now pegged at $1 billion now is expected to grow at 71 per cent CAGR to $5 billion by 2020.